Hotel Silver Rock is a 2 star budget hotel in Mussoorie offering well furnished accomodation with state of art facilities to the guests. Well decorated rooms, delicious food, modern facilities and Himalayan/valley facing rooms makes Hotel Silver Rock a best budget hotel in Mussoorie. Conveneintly located at walking distance from major tourist spots in Mussoorie, Hotel Silver Rock is known to offer warm personal service to the guest and makes travellers to feel a home away from home. Its rooms are airy, sunny and provides scenic views from the windows of each room. The hotel have wwell equipped meeting room attached with world class technology makes. Hotel Silver Rock is conveniently located on the famous Mall Road in Mussorie, at 2 min walking from Library Gandhi Chowk. Nearest railway station is at 32 kms in Dehradun and the Jolly Grant Airport is at 32 kms away from Silver Rock. 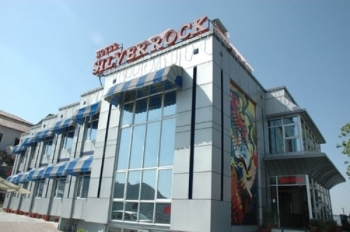 Hotel Silver Rock provides well furnished rooms of various type. Standard rooms are basic rooms having all necessary amenities. Super Deluxe, Royal Classic and Executive rooms have some extra modern facilities like mini bar refrigerator, Bathrooms with shower. All rooms have well interiors and a Himalayan/valley facing window providing panorama of Mussoorie. Rooms in front are valley facing and in back Himalaya facing. On a bright sunny day, open air multi cuisine restaurant of Siver Rock hotel become more attractive with Indian, Muglai and Chinese food on tables.A high standard of cleanness and hygiene is followed the restaurant. Guests are free to eat both at restaurant or room. Food cook by experts are delicious and try to satisfy wide variety of tastes of the guests.